Christmas is a celebration of the birth of the Jesus — Jesus who is the lover of my soul. Jesus, my Savior and Redeemer. Jesus, the joy of my spirit. Jesus, the Lion of Judah. Jesus. I will admit that I don’t always keep the spirit of Christmas and I get caught up in the hoopla of the season. I shop too much, buy too many presents, and see every sort of thing I want from new furniture to funky seasonal sweaters (I restrain myself… well, sometimes). Now I love decorations as much as the next person. In fact, I am a lover of color Christmas lights. I think white lights look all pristine and orderly. I like my Christmas decorations to be big, bright, and just this side of gaudy. Now, I do draw the line at tacky, but I love some flashy decorations. I am troubled by a big yard inflatable yard ornament (what else do you call these things? Display?) This infatable …. scene is on my route to work, so I see if every day and every day I wonder… why? It’s an inflatable nativity scene and that just seems … well, wrong to me. 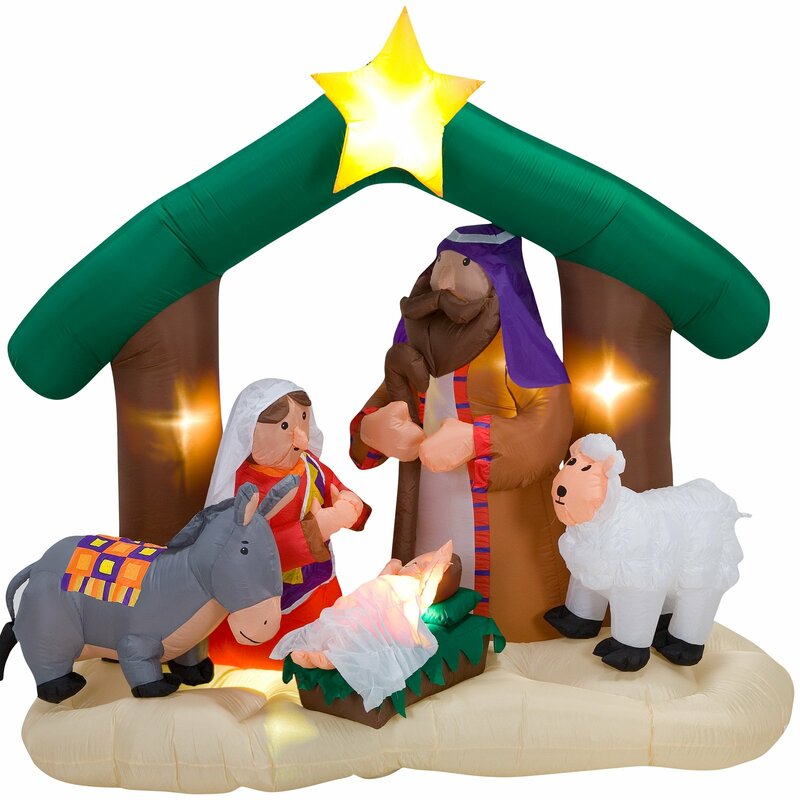 I love the idea of putting a nativity scene on display and please if you have an inflatable yard ornament don’t throw rocks at me. Read on. I’m not a big fan of the inflatables, but some of them are pretty funny. I think rudolph is fun and Santa on the Harley is hilarious, but a blow up baby Jesus? I just don’t think so. It’s especially sad when the blower is turned off and the nativity deflates and just crumples to the ground. And when little ones play bop-it with Mary or use Baby Jesus as a soccer ball and popHim up in the air with their head, feet, whatever. That’s just so wrong. And then there’s the neighborhood dog (usually mine) who barks at the blow ups and then, when the wind blows just right and the lamb seems to move, the dog leaps and tackles the lamb to the ground. Doesn’t exactly scream Joy to the World! So, I want to keep the season focused on the birth of the Savior, but I have to draw the line at the inflatable nativity scenes. Can’t we just have some wooden cut outs? We can even outline them in lights — color lights! We can use those flashing LED lights that make your yard look like a landing strip at the airport. So keep that Christmas spirit, and if you happen to have one of those inflatable nativity scenes I urge you to reconsider. Try a big ol’ LED star over your house… but remember to register it with the FAA. You don’t want any unschedule landings on your roof. Now that brings me to the Santa and reindeer on the roof…. please don’t let Santa dangle from the roof by the reins. I’ve seen more than one child traumatized by this visual. Okay, before I get off on more yard ornaments, I wish you all a happy day. I’m off to shop! I’m going to rejoice in the Lord and give thanks to my savior and Lord for this season that is a celebration of the life we now have in Christ. Joy filled life! Abundant life. A life in Him! I’m all about being filled up with the breath of the Spirit, but something about the baby Jesus being filled up with hot air is wrong. Hey, Mary-Mary! I’m with you on the inflatables–and one of the nativity seems way over the top. People who have those also are the ones still wearing sweaters that Big showcased today. LOL! !